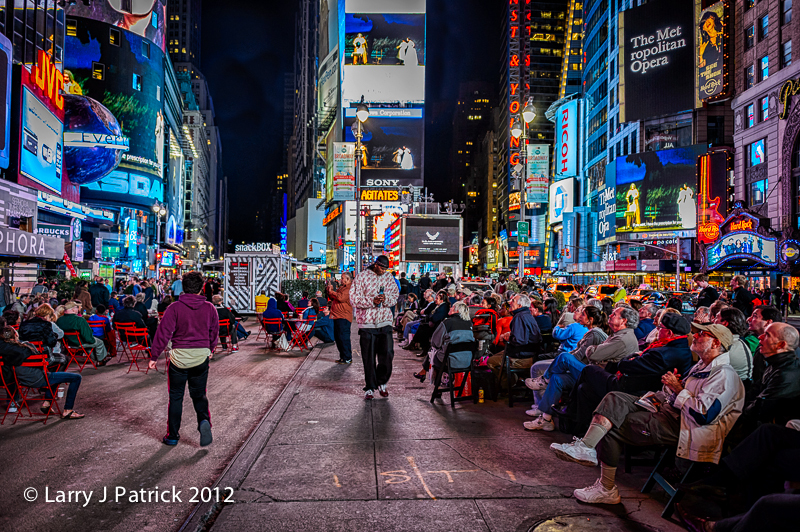 Today’s photo is another one taken in New York City’s Times Square. It is one of JD’s favorite photos from our trip this year. You are probably asking yourself: “why are all of these people setting in Times Square?” Well, every year the opening opera of the New York Metropolitan Opera is projected on screens in Times Square. You can see four screens in the photo, but I counted sixteen screens that were showing the opera. What do I like about the photo? For sure, it is the intensity of the viewers watching the screens. They are totally into the performance. Camera settings: Nikon D4, 28-300mm f/3.5~5.6 at 70mm, ISO 3200, f/5.6 at 1/90th of a seconds. Lightroom 4—applied Standard preset during import, set white and black points and added vibrance and added clarity to make the photo look similar to an HDR photo. An event that I and my husband look forward to each year.